ANC leaders were not constrained in the 1990s by a desire for economic stability but entered into a pact with Afrikaner nationalists and big business. This pact now needs to be broken. 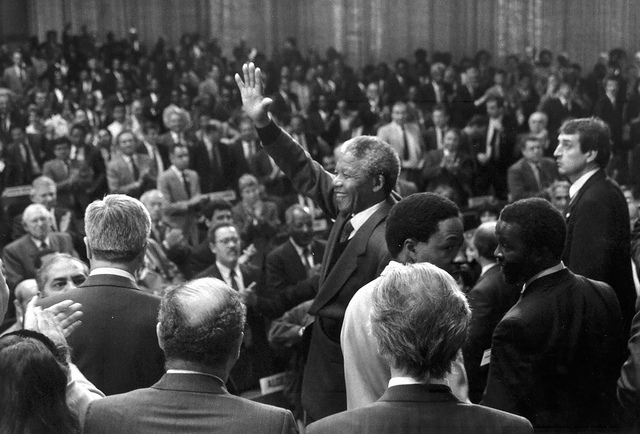 Nelson Mandela addressing the International Labour Conference, Geneva, in 1990. Credit: ILO. 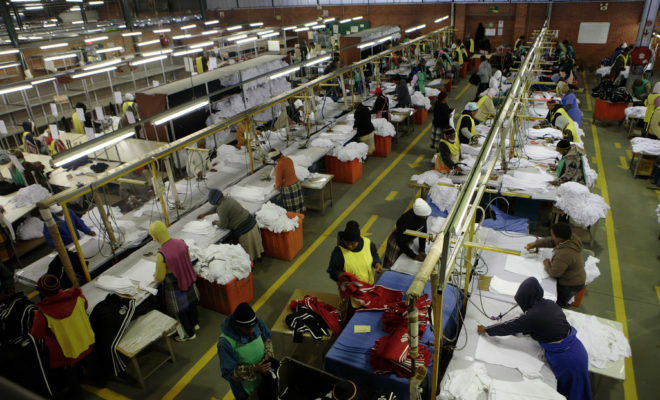 Is South Africa finally maturing to the point that the economic − not just political − compromises of the 1990s democratic transition can be reconsidered? When engaging student activists, for example, University of the Free State rector Jonathan Jansen frets that “If [former President Nelson] Mandela gets any mention at all, it is as a sell-out, the man who led South Africa into a soft transition that left white privilege undisturbed and black poverty undiminished”. There has been tough questioning of Mandela’s deals by a diverse range of critics. They include: the leader of the opposition Economic Freedom Fighters Julius Malema; Black Consciousness ideologue Andile Mngxitama; Soweto community activist Trevor Ngwane (way back in 2003); and Stellenbosch political economist Sampie Terreblanche. Insiders like Winnie Madikizela-Mandela and ruling ANC stalwart and former minister Ronnie Kasrils have equally been critical of the compromises Mandela made. In 2013, Kasrils explained how Mandela signed a self-sabotaging “Faustian Pact” with global capital. In mid-1994, I saw those devils up close when I participated in government policy debates as editor of the Reconstruction and Development Programme White Paper, and again as drafter of the aborted 1996 National Growth and Development Strategy (Gear). In answer to the question “Was Mandela pushed or did he jump?”, my view is that there’s a bit of ‘structure’ – externally-imposed necessity – and individual ‘agency’ in answering ‘both’. In his 2005 book and a more recent article, former Presidency official and now academic Alan Hirsch justifies neoliberal compromises on grounds the new government was “constrained by concerns for economic stability”. Yet weren’t government’s deals the main cause of subsequent economic instability, including the half-dozen currency crashes between 1996 and 2009 when Trevor Manuel was finance minister? The repayment of the US$25 billion apartheid-era foreign debt. This denied Mandela money to pay for basic needs of apartheid’s victims. Giving the South African Reserve Bank formal independence. This resulted in the insulation of the central bank’s officials from democratic accountability. It led to high interest rates and the deregulation of exchange controls. Borrowing $850 million from the International Monetary Fund in December 1993, with tough conditions persisting for years. These included rapid scrapping of import surcharges that had protected local industries, state spending cuts, lower public sector salaries and a decrease in wages across the board. Reappointing apartheid’s finance minister Derek Keys and Reserve Bank governor Chris Stals, who retained neoliberal policies. Joining the World Trade Organisation on adverse terms, as a “transitional”, not developing economy. This led to the destruction of many clothing, textiles, appliances and other labour-intensive firms. Lowering primary corporate taxes from 48% to 29% and maintaining countless white people’s and corporate privileges. Privatising parts of the state, such as Telkom, the state-owned telecommunications company. Relaxing exchange controls. This led to sustained outflows to rich people’s overseas accounts and a persistent current account deficit even during periods of trade surplus, and raising interest rates to unprecedented levels. Adopting the neoliberal macroeconomic policy Gear. This policy not only failed on its own terms, it also caused developmental austerity. Giving property rights dominance in the constitution, thereby limiting its usefulness for redress. Approving the “demutualisation” of the two mega-insurers Old Mutual and Sanlam. It was the privatisation of historic mutual wealth for current share owners. Permitting most of South Africa’s ten biggest companies to move their headquarters and primary listings abroad in the late 1990s. The results are permanent balance of payments deficits and corporate disloyalty to society. I believe that this list shows that the ANC leaders were not “constrained” in the 1990s by a desire for economic stability but entered into a pact with Afrikaner nationalists and big business. The constraint was mainly a concern to comply with world economic orthodoxy at a time their prior Moscow sponsors had given up the ghost. Consider also the structural dynamic then and still in play: capitalism’s “financialisation”. As manufacturing and mining declined, the share of finance in Gross Domestic Product (GDP) soared from 6% in 1994 to 13% by 2010. Financial liberalisation gave South Africa the appearance of a healthy GDP growth of 5%/year just prior to the 2008 world crisis. Yet given the 1990s deals, this growth was largely froth. It was whipped up by spending on the 2010 World Cup, by bribery-induced white elephant infrastructure, and by the 2002-08 commodity price blip. In addition, the early 2000s witnessed a consumer debt boom. But by 2008 soaring interest rates made repayment obligations difficult for 70% of borrowers. South Africa’s medium-term interest rates are the fourth highest among the world’s 57 main economies, lagging only behind Brazil, Turkey and Pakistan. Financial froth also included what The Economist measured as the fastest-rising speculative real estate bubble on earth from 1997 to 2008. The froth included insane valuations of the country’s stock market. By late 2015, the market value of the Johannesburg Stock Exchange (JSE) was 320% higher than GDP, the Buffet Indicator. This was the highest recorded level of any major country’s modern stock exchange, with only Singapore (304%) and Switzerland (281%) close. Add in and stir South Africa’s world-leading inequality, a poverty rate of 63%, and an unemployment spike from 16% in 1994 to 26% by 1998 with a plateau since. Given the resulting damage, isn’t it time, finally, to honestly confront the dozen devils, and discuss how to reverse the damage, by undoing the deals? The ANC is notorious for talking left and walking right. Forced corporate repatriation is one issue. Others include lowering interest rates and, to stop capital flight, re-imposing tougher exchange controls (as the Chinese did last week to slow outflows). Then a genuine industrial policy could substitute for imports, rebalance the economy and prioritise labour-intensive ecological sustainability. Lower interest rates would also increase policy space to raise state social spending and reorient infrastructure to meet unmet basic needs. But to adopt such obvious reforms would require radical economic transformation led by an honest government, not just rhetoric from a duplicitous, exhausted nationalist regime. And most important, it would require a powerful democratic movement from below. Patrick Bond is a Professor of Political Economy at the University of the Witwatersrand. AAP#8: Who will win Uganda’s 2016 elections? LAPSSET: Will a new highway open up the long-neglected Garissa? That ‘deal’ is the ONLY thing that has kept the Lights on in SA this long. So yet again everything is to blame on white folk and the apartheid regime. No responsibility or accountability given to the current government, who has ruled for 22 years now. Mr. Bond, with a mentality of denial, South Africa will NEVER move forward. A person with the intelligence of a professor, of all people, should know better than the blame shift you have just performed in this article.